Residents of the southeastern Turkish city of Diyarbakir’s historic Sur district cannot afford the new homes erected following fighting between security forces and Kurdistan Workers’ Party (PKK) militants, journalist Diego Cupolo reported on Monday in IRIN, a news website focusing on humanitarian stories. The fighting, which erupted following the failure of a peace process in July 2015 lasted until March 2016, forced Sur’s largely Kurdish residents to flee the district and resulted in large scale destruction of property. More than 24,000 have still not been able to return to Sur, contributing, said Cupolo, to enmity between local Kurds and Turkey’s central government. In March this year, in the run up to elections, Turkish President Recep Tayyip Erdoğan visited Sur and pledged to renovate the district and create a vibrant local economy as part of a broader plan to revitalise Turkey’s impoverished, mainly Kurdish southeast. But government opponents believe Erdoğan’s administration plans to profit from the displacement and is engaging in demographic re-engineering. The neighbourhood of Sur in the majority-Kurdish city of Diyarbakır in Turkey, which was fortified against the Turkish military by a youth wing of the Kurdish-nationalist Kurdistan Workers’ Party (PKK) after a peace process collapsed in July 2015, is one of the main sites of a government policy of demolition and rebuilding, Reuters said. “The redevelopment of Sur is part of a broader plan, costing 10 billion lira ($2.44 billion), to rebuild areas of seven towns in the largely Kurdish southeast that was damaged by conflict between Turkish security forces and Kurdish militants following the collapse of the peace process in July 2015,” it said. After months of clashes with the Turkish military between late 2015 and early 2016, the government published a decision nationalising 80 percent of the properties in a swathe of the eastern part of Sur. These were then demolished and are being replaced with newbuilds. In April 2017, this policy was extended to parts of the southwest of the district. “Sur's eastern half is now desolate, the destruction evident from this satellite photo dated April 17, 2018. 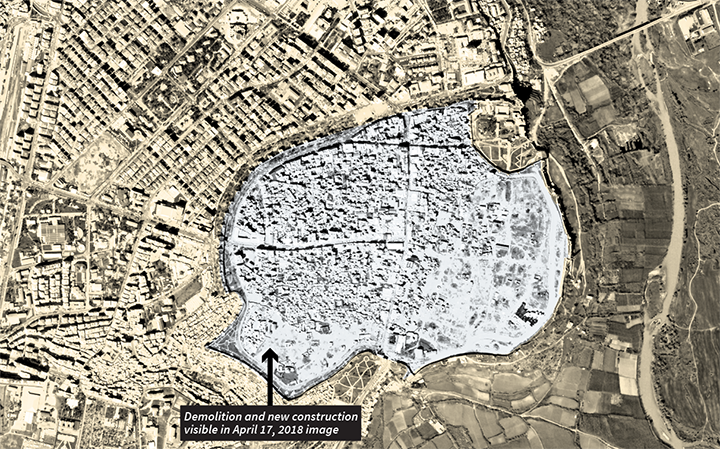 Where there was once a warren of narrow, bustling streets behind its 6 km-long basalt Roman-era walls, there is now an expanse of wasteland awaiting redevelopment,” Reuters said.